The Lovejoy Leopards varsity picked up a pair of victories with wins over Sherman and Plano East on Thursday. Lovejoy opened up tournament play in the Jesuit Baseball Classic against Sherman at Jesuit's home field in Dallas. 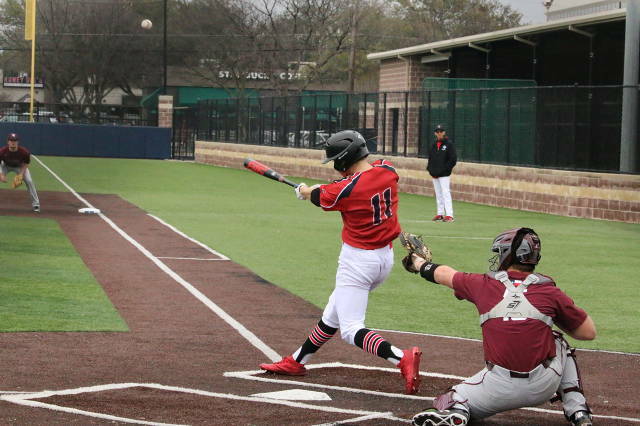 After the Leopards cruised out to an early 8-0 lead, Sherman was able to close the gap by scoring three runs in the seventh inning, but Lovejoy hung on to win 8-4 on Thursday. Lovejoy got things started in the first inning when Jordan Yoder drove in one when he singled scoring pinch runner Mason Marsh who had stolen third base two pitches earlier. After plating two in the top of the first, Lovejoy added three runs in the second inning. The Leopard's offense in the inning was led by Luke Stine, Michael Difiore, and Yoder, with all three knocking in runs in the inning. Lovejoy extended their lead to 8-0 in the top of the 5th when Cameron Pool mashed a two run shot to the right center field gap scoring Jacob Eschler. Difiore led Lovejoy to victory on the pitcher's mound. He went five innings, allowing four hits and one run while striking out five. Luke Finn and Jack Treanor entered the game out of the bullpen and helped to close out the game in relief. Lovejoy saw the ball well against Sherman, racking up ten hits in the game. Yoder, Matt Piccirillo, and Luke Stine each collected two hits for Lovejoy, while Logan Bowling and Mason Marsh each scored a pair of runs to lead the Leopards. Lovejoy was sure-handed in the field and didn't commit a single error. In the second game, played at Bishop Lynch High School, Jordan Yoder went the distance for the Leopards in picking up the 4-3 win against Plano East. Yoder spread 11 hits across seven innings, but avoided giving up a big inning and limited the Panthers to only two earned runs. Whereas the Leopards maximized their four hits and two sacrifice fly opportunities. Michael Difiori drove in Jacob Terwilliger, who made his season debut earlier in the day, after coming back from a broken hand. Terwilliger later drove in Cade Smitherman on a sacrifice fly to give Lovejoy their first lead at 3-2 after Smitherman moved over to third on a base hit by Logan Bowling. Lovejoy took the lead for good in the top of the 7th inning when Luke Howell singled to drive in Jacob Eschler with the go ahead run. Cameron Pool connected on this 5th Inning homerun to extend Lovejoy's lead to 8-0.